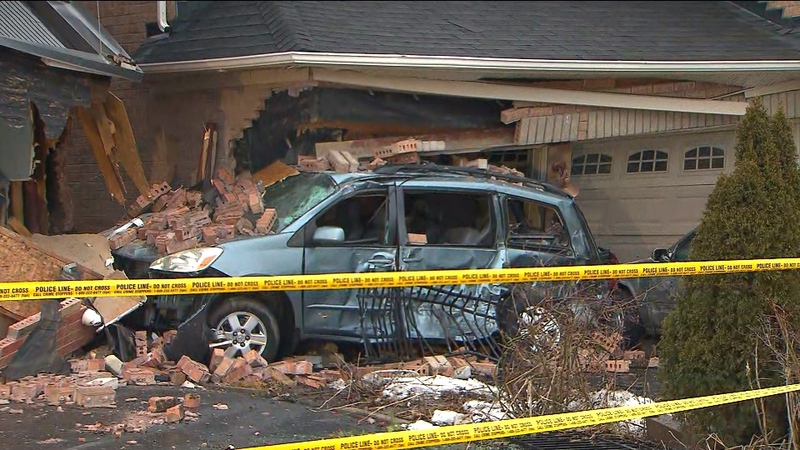 A TTC bus driver who crashed into two homes in Scarborough last week has been charged with careless driving, police confirm. The incident, which was captured on a security camera, occurred on Oasis Boulevard, in the area of McNicoll and Morningside avenues, at around 1:40 a.m. on Thursday. Security video shows the bus driver failing to negotiate a curve, jumping a curb, slamming through a fence, and crashing into two homes in the area. It is not known what caused the driver to lose control of the vehicle. Police previously said that there was no indication that the driver tried to brake or steer the bus out of the way of the homes. The impact of the collision caused the front balcony of one of the houses to collapse. A number of parked vehicles were also damaged in the crash. The bus driver was taken to hospital as a precaution and no other injuries were reported. The operator was subsequently suspended with pay pending an investigation and on Tuesday, police confirmed that he has now been charged with careless driving in connection with the incident. TTC spokesperson Stuart Green said the driver is not currenlty operating a TTC vehicle and any further action taken against the operator will be determined once the transit agency's investigation is complete.